Victor van Wyk recently found two large-spotted genet babies in his garden. After a thorough search, he was unable to find the mother. He lives in a busy neighborhood, where there was a good chance of the young genets getting caught by a dog or cat, so he decided that the best thing to do would be to take them to Hoedspruit Endangered Species Centre (HESC). When we opened the box, the first thing we noticed was their very long tails. The poor creatures were trembling and mewing loudly. And with their eyes still closed, and no mom on hand to comfort them, they were naturally quite distressed. Three days later Victor phoned us again. He’d found another tiny genet, and it was soaking wet from the previous night’s rain. When we heard this we expected the worst, but this little guy turned out to be a fighter. Not only did he pull through, he also ended up being the strongest of the three. Victor and his family named him Milo, and he is currently being cared for at our sister property, Camp Jabulani. 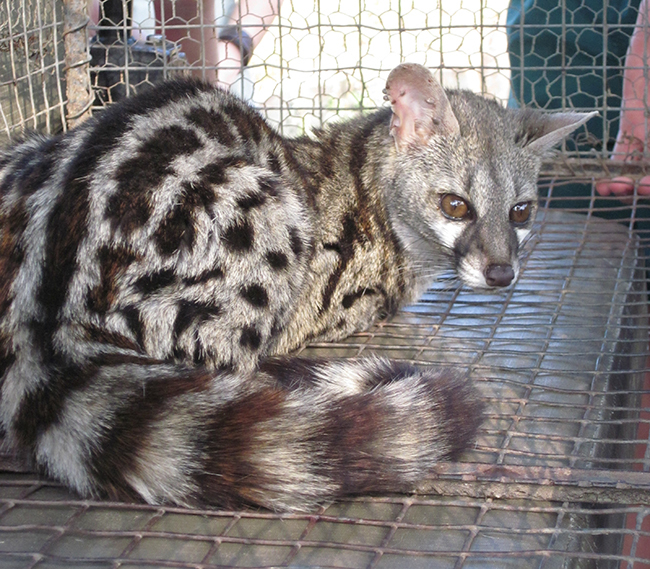 When the genets first arrived they weighed a mere 80g each, which meant feeding them was a real challenge. It took quite some convincing to get them to drink the milk formula. Getting them to urinate and defecate wasn’t a walk in the park either, but before long they were going potty like real pros – much to the dismay of the guide who picked them up and got a wet sleeve for his efforts. Their eyes are open now, and it’s also becoming clearer to us why they are so well suited to living in trees. Using us to practice on, they expertly clamber up, down and around our arms and shoulders. What they enjoy the most is to be picked up by someone with long hair. For some reason, they just love cuddling and snuggling in the long locks. The result is messy, but they’re so sweet we just can’t say no. 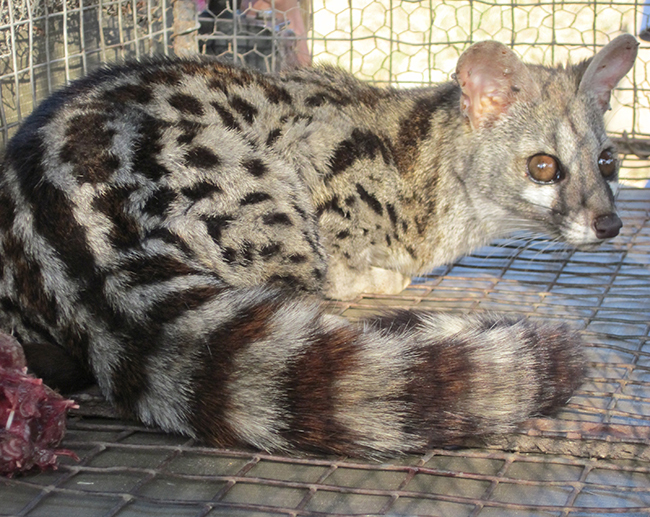 The genets were kept at the Centre until March 2013, when they were released at Camp Jabulani. During the time that they were at the Centre, they gave all the staff and students much joy. They were fed fruit and day-old chicks, and were in excellent condition. Food was hidden in the enclosure for the genets to search for. We believe that they will do very well in the wild, and that they will easily adapt to their environment. Lente Roode Jnr assisted in the release, as they were very close to her heart. Another heartwarming story with a wonderful ending, thanks to the dedicated staff of the Hoedspruit Endangered Species Centre (HESC).